TRIVIA of Noh : Q73 : Why do musicians call out? | Home | Trivia | Q73 : Why do musicians call out? Why do musicians call out? It is necessary for the musicians to call out because they have to control the progress of the music with each other while they are all facing toward the front. 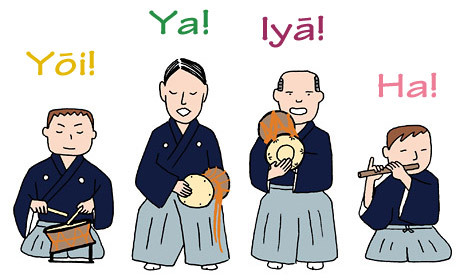 There are four basic types of call: "Ya", "Ha", "Yōi", and "Iyā". Musicians create variations in by changing the strength and accent, depending on the atmosphere of the piece. The calls are also important for the actors as a signal for their movements. On the other hand, the best performances do not happen if the actors and musicians are striving to keep themselves in time through the calls. A performance of a lifetime is produced on the stage only by understanding and responding to the intentions of others.